Surprisingly they all have been about new levels. Looks great. I still prefer this game any day over Yooka Laylee. The only suggestion I have for the author would be to invest some time in improving the lighting/post effects using some Unity assets like Time of Day and PRISM. Otherwise, awesome job on a "true" Indie game. Your work also proves that Yooka could have made their game for the Wii U. The supposed technical difficulties are just a smoke screen in my opinion. [EDIT] Fixed my post because I had mistaken the OP for the author. Last edited by tomjscott on Fri Mar 24, 2017 7:05 pm, edited 1 time in total. tomjscott wrote: Looks great. I still prefer your game any day over Yooka Laylee. The only suggestion I have at his point would be to invest some time in improving the lighting/post effects using some Unity assets like Time of Day and PRISM. Otherwise, awesome job on a "true" Indie game. I'm not the maker of the game if that's what you think, I'm simply posting about it because I'm interested. But regardless I don't apreciate your attempts at pretending to care just to troll. Sorry for mistaking you for the developer, but I'm not pretending to care. I genuinely love what the author has done on that game and I've supported it for quite some time. Just take a look at my comments on his IndieDB page. Name calling is rude and I don't appreciate it. tomjscott wrote: Sorry for mistaking you for the developer, but I'm not pretending to care. I genuinely love what the author has done on that game and I've supported it for quite some time. Just take a look at my comments on his IndieDB page. Name calling is rude and I don't appreciate it. Sorry, I see now you have posted and shared your stance before. I assumed you were part of the 1-2 posts accounts that have been surfacing today to antagonize YL due to recent drama. My apologies again and I'm glad to see more people interested in this project. Apology accepted. I know of no recent YL drama. I just got a notification of your message and I responded. I find it really admirable that the developer keeps on trying to get his game up despite all the setbacks of the past he's really dedicated. I'm looking forward to when this releases too. Lobodestroyo had an update on their website recently too so I'm glad to see that one's not dead either. Looked into this a bit more, and wow, I think it looks amazing. To be honest, I wonder whether people shouted "knockoff" at Jak & Dexter or Ratchet & Clank in the past. Because those two games certainly use the same duo dynamic Banjo-Kazooie uses, and I don't recall them being hated at all. In fact, comical duos have been a trope since like forever, and you find them everywhere. Be it Pinky & Brain, Asterix & Obelix, Laurel & Hardy, Rick & Morty... Buddy-platformers just put this working premise into a game, and it's not like Banjo invented 3D platforming either. Admittedly, the combination isn't that common, but given that there are 3 games from that era that do this, it looks more like a general throwback to me. I do suppose that dropping the backpack might be a good idea to differentiate the rabbit more from Banjo (and Ratchet), though, and perhaps the story should take care to not get too close to Crash Bandicoot Warped (which was a Naughty Dog title just like Jak & Dexter)... Oh, and the side-flip might be a bit too obvious a Mario reference for some people. The game also has a patreon now. People who contribute $5 can become alpha testers for the game and get a free copy if donated for more than three months. Ever since I posted this and before the trailer there has been three more updates: a swamp-casino level, a giant house level, and a cutscene introducing an important npc. 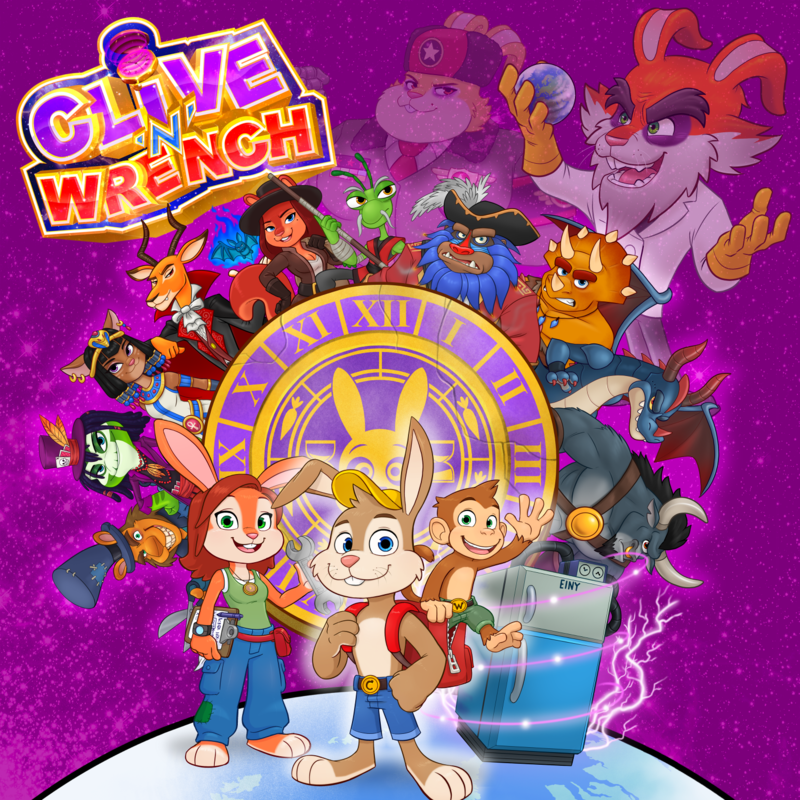 The Clive & Wrench Trailer looks great. Far superior to Pewka Laylee. A true spiritual successor instead of something that makes fun of itself and the genre. Needless to say, making games takes time. me i find the game look good. I'm really impressed by how drastically the game has improved from when they first showed it off. I'll definitely give it a try now. Is it bad that I feel that these characters / character-designs are more lively than the ones in Yooka-Laylee? It looks like this guy really dug into the level themes when coming up with characters. i think i will buy this game.. i find it really look like banjo..
not like hat in time and snake pass ratchet/clank , who i find completely different. Just became a Patreon supporter for this game. I’m really impressed with how the game is coming along.